A fisherman would lash a barb to one arm of the hook and traditionally carved a “spirit helper” into the other arm to provide supernatural assistance. The Tsimshian, who lived along the northern coast of British Columbia, caught halibut by setting large V-shaped hooks on the bottom of fishing banks. Usually, the hooks were made of wood, bone, and spruce root. A fisherman would lash a barb to one arm of the hook and traditionally carved a “spirit helper” into the other arm to provide supernatural assistance. This example has twine threaded through the centre of what looks like a sea lion. This article originally appeared in the October, November 2012 issue of Canada’s History magazine. Efforts have been made to repatriate the remains of several indigenous Labradorians who died in Europe while being part of a travelling zoo exhibit in the 1880s. How Canada stole an Indigenous veteran’s family identity and land rights. 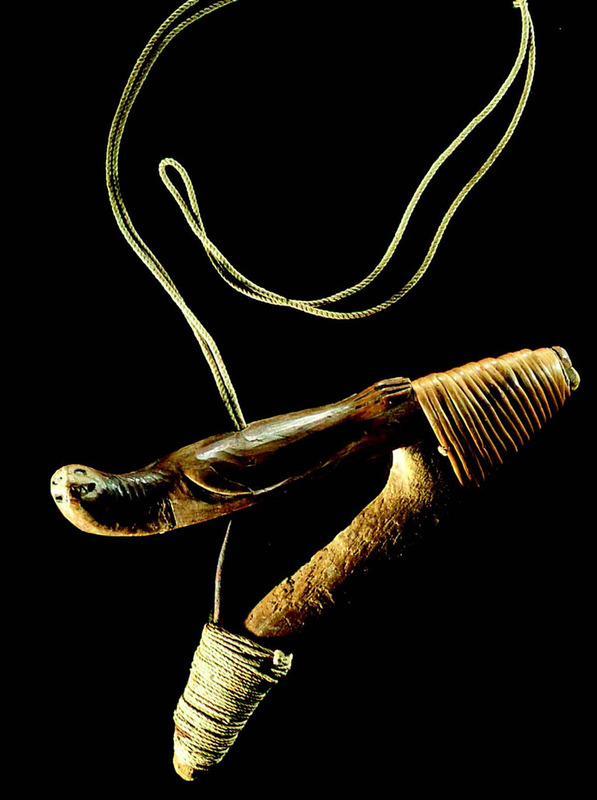 Employed in the hunting and trapping of birds, this Inuit weapon was an elegant form of slingshot used during the early twentieth century.